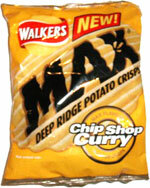 Taste test: These are the standard Walkers Max thick, wide-rippled chips, with a very tasty (but not hot) Curry flavoring. The flavor is so good that all you taste is the curry — close your eyes, and you might forget that you're eating potato chips. If you like curry, you'll love these. If it needs to be hot curry, try a different curry chip. Smell test: Very nice, real authentic curry smell. Nice! 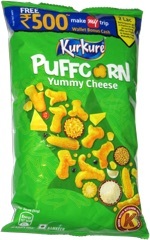 Trivia: This is the only snack I've ever seen with "rusk" in its ingredients.